Independence Day is an annual observance, celebrated every year on the 15th of August. On this day we achieved our freedom from the British rule in 1947, after long years of slavery. This year on 15th August 2018, as always, RIET congregated to pay tribute and remember all the freedom fighters and their contribution to the Liberation of the country. Principal RIET (Prof) Dr. Saroj Hiranwal hoisted the national flag. All the students, HODs, Teachers and staff saluted the flag and sang in unison the National Anthem. Principal RIET (Prof) Dr. Saroj Hiranwal, delivered a short speech and told the students about the supreme sacrifice the great martyrs gave for the sake of freedom, and also mentioned that the freedom was very precious and it was very necessary to preserve it. She encouraged all students and faculty members to perform their own duties to uplift the society and nation. 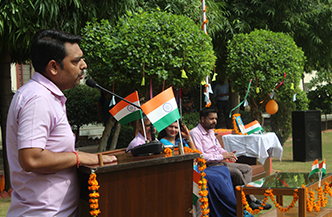 Dean Academics, Prof Kapil Dev Sharma, spoke on the significance of the historic day. He encouraged the students to always perform their utmost regarding their career and which in turn is a great work towards the society and nation. He emphasized that engineers are the creators of the universe, therefore, our duty is all the more important to prove ourselves. Vice Principal RIET, Dr. Sachin Sharma, spoke on the occasion. He advised the students to become ideal citizens of the country. He encouraged all to come forward and work towards the betterment of the country and humanity. It is the responsibility of the citizens of an Independent nation if they do not dedicate themselves to the service of this nation they fail in their duties. Taking steps for that can makeRIET a great institution dedicated to the service of the nation. The Cultural Programme was a great performance put up by students of first year freshers and also other senior students. Patriotic Poems and Songs were recited by the students. Some students also presented the group dance and a skit. Students group from the first year demonstrated a skit on social issues of the society. The Sangharsh group also put up a skit on army life. Songs and dances were a wonderful attraction of the day. Tree plantation ceremony was also held on this day. The RIETians pledged to keep the environment healthy and green by planting more and more trees. 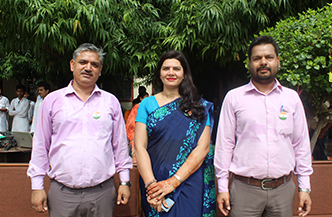 Principal RIET (Prof) Dr. Saroj Hiranwal and Dean Academics, Prof Kapil Dev Sharma, Vice Principal RIET, Dr. Sachin Sharma along with all the faculty members and students participated in this ceremony and planted saplings in RIET campus. The programme concluded with a patriotic feeling and exhilaration in the hearts and minds of all present, which was indeed exemplary. In the end, sweets were distributed among all.